John says that the attached carries the message "Best Wishes from all at Lilleshall House. I hope you will recognise our station". If this is the Lilleshall House in Shropshire the nearest station would be Donnington on the Wellington to Whitchurch line. 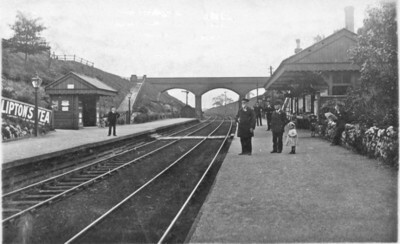 John adds that this is not Donnington and he is not convinced it is LNWR as the signals look wrong. Perhaps there is another Lilleshall House but he has been unable to trace one if so. Sadly the stamp has been removed and what is left of the postmark is an S suggesting perhaps Staffs. The card was sent to Longton. Cobridge, Staffordshire has neen pencilled on the back, but that is certainly not correct. Any thoughts? This station looks very much like Meir on the Knotty Line from Stoke to Derby. Next station is Blythe Bridge, and previous were Longton and Normacot. The message "Best Wishes from all at Lilleshall House" would perhaps suggest a sender who had the "authority" to send best wishes from all at the stately home (i.e. a member of the Duke of Sutherland's family - not a servant - with "all" meaning something like "all the family and guests now present" - not the groom, the butler and the parlourmaid!). And "our station" might not refer to the station closest to the House, but the station nearest to where the sender of the card (perhaps a relative on a visit to Lilleshall House) lived and which the recipient (also residing in that locality) might be expected to recognise. I would suggest a station on the NSR - a very similar station was Bucknall and Northwood. Click here for Google search results. Not the same station, but very similar. Could the postcard perhaps show Fenton Manor which I think also had similar buildings? I can confirm that this is indeed Meir station.